There are some flaws in this book. While Forward does most things well, the fact that she is a novice writer does show at times. Her prose can be somewhat clumsy, and she doesn't do a very good job of establishing the world where this all takes place...sometimes city names are thrown at the reader as if we already knew the history of this fictional world before even reading this book. And then there's Robin...a centaur who joins the villains in order to act as a spy for the good guys. Robin is so very whiny and annoying at times! Normally, these flaws would have made me knock a star off...except that the good parts of this book are SO darn good! 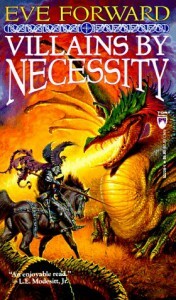 "Villains By Necessity" has been out-of-print for some time, making it hard to find, but trust me, it's worth the effort!